Every now and then, unexpected events can take people by surprise. That happened recently with the UK’s EU referendum, plus of course this week’s US election result, and it caused a flurry of activity across world markets. Short-term volatility can make investing in shares uncomfortable, but that discomfort comes with the territory and it’s important to keep it in perspective. We manage your assets to an investment strategy that is designed to achieve your financial goals. Where those goals are longer term, we use stocks and bonds to provide the growth required to achieve a positive return, above inflation. 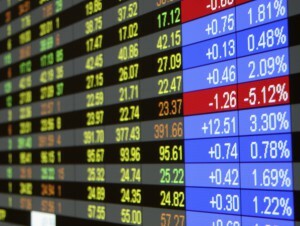 The value of shares can rise and fall from day to day, month to month and even from year to year. But, over time, they have provided a higher return than many other comparable assets. The image below illustrates the point. It shows the MSCI All Country World Index, a broad index of stocks from around the world across both developed and emerging equity markets, and, for historical context, a selection of news headlines. 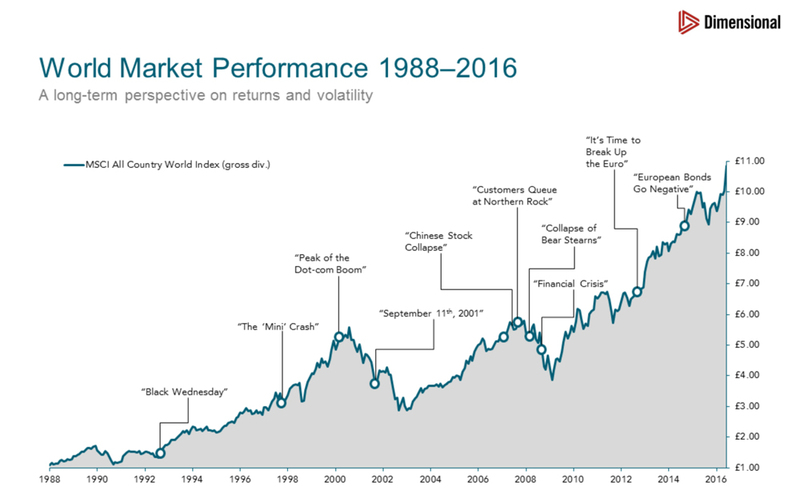 It is clear that recent volatility is not unprecedented and while uncertainty can make investing uncomfortable, world stock markets are still capable of delivering a positive return in the long term. Since 1988, when this index starts, £1 invested has grown to £10.84. The message is: stick to the plan, even during times of uncertainty. It sounds simple, but requires self-discipline and a belief in the power of markets that we can help you achieve. And with that discipline comes the ability to take surprises in your stride. Source: MSCI data ©MSCI 2016, all rights reserved. Figures in GBP as of 1 June 2016. Indices are not available for direct investment. Their performance does not reflect the expenses associated with the management of an actual portfolio. Past performance is not a guarantee of future results. Actual returns may be lower. If you would like to arrange an investment consultation, please call Tim Norris or Alan Clifton on 0800 731 7614 and we would be delighted to arrange a meeting at our offices in the heart of Teddington.